This gnarly tangle of kelp parts is beautiful and stoic. The beach doesn’t withhold its treasures and it’s amazing to see this combination of textures and colors. 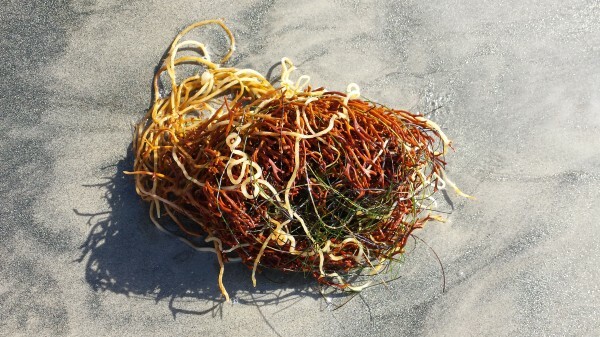 Kelp has so many forms and colors; and it appears on the beach no matter what the conditions. I am trying also to appear on the beach no matter what the conditions. I haven’t been feeling well so I took an abbreviated walk today. The air was so fresh and clear, the sun was warm, the breeze just perfect; I felt revitalized after the walk. Wore my beach shoes and let my feet get wet; that was very freeing. The ocean as restorative once again!